Our watch editor Rebecca Doulton takes a look at the nominees in the women’s categories and predicts the winners for the coveted 2016 GPHG awards. It’s Oscars time for watches, and nervous candidates in 12 different categories are parading their charms and showing off their complications to win over the judges and take home a coveted first prize at the Grand Prix d’Horlogerie de Genève (GPHG) awards on 10 November. With my fortune-teller’s turban in place and a crystal ball on my desk, I spy 72 watches, and my task for today is to predict the winners in the three categories reserved for women's watches. Composed of six lovely contestants, the Ladies' category is open to quartz and mechanical movements but restricts the amount of sparkle to a maximum of 5 carats, simply because there is another category devoted to high jewellery watches. I have to admit that I am torn between three watches here: the sleek, coiling black ceramic Bulgari Serpenti Spiga, the dreamy Fabergé Lady Levity with a ghostly Moon on the dial, and the fluid contours of Piaget’s Limelight Gala watch. 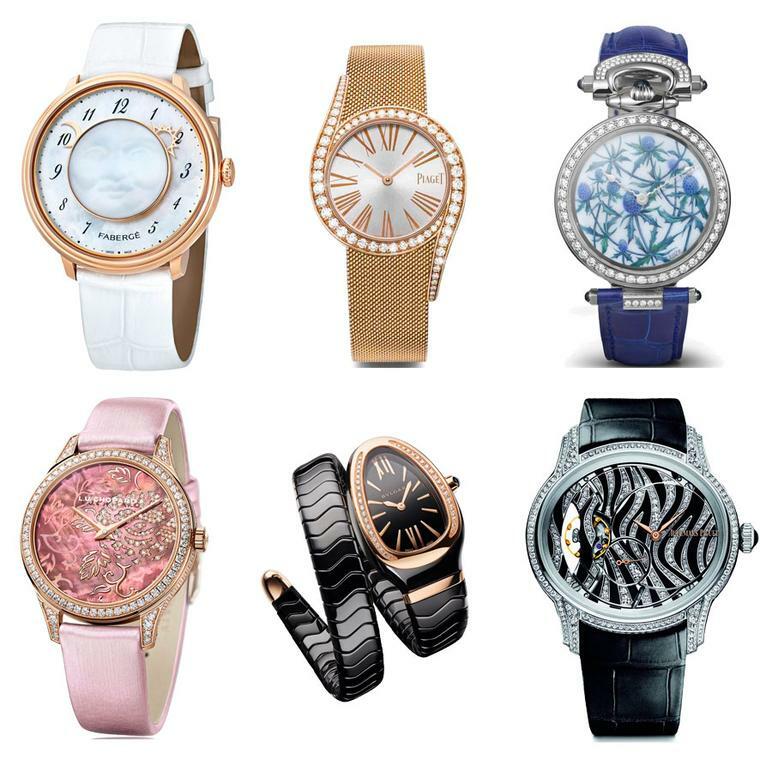 Clockwise from top left: Fabergé Lady Levity; Piaget Limelight Gala; Bovet Blue Thistles; Chopard Peony; Bulgari Serpenti Spiga; Audemars Piguet Millenary. However, I predict that Piaget’s sophisticated Limelight Gala watch, below, will win first place in the Ladies’ category. Evoking the brand’s fabulous jewellery creations and woven gold bracelets of the 1960s and 1970s, the Limelight Gala features a sensual Milanese gold mesh bracelet that is silky to the touch and sits beautifully on the wrist. The tapered diamond-set lugs are the distinguishing trait of the Limelight Gala and add a wonderful sense of movement to the piece. Moving up into more complicated ground is the Ladies’ High-Mech (mechanical) category, defined by the GPHG as being “remarkable in terms of their mechanical creativity and complexity”. 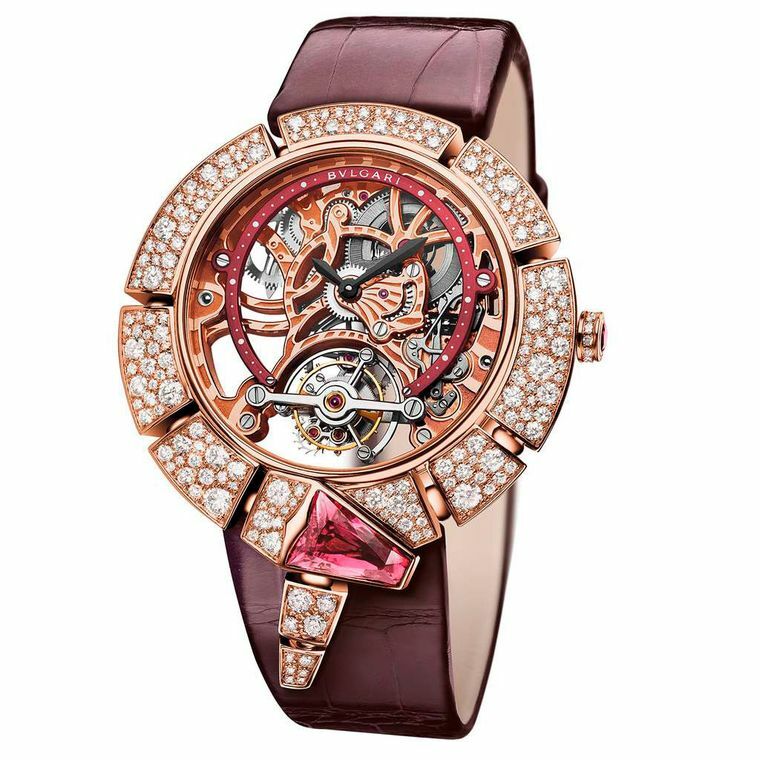 Whirling tourbillons grace the dials of three contestants, while ingenious ways to display the time are the overriding feature of the Louis Vuitton, Christophe Claret and Ludovic Ballourard watches. Ulysse Nardin Skeleton Tourbillon; Christophe Claret Marguerite; Ballouard Upside Down; Girard-Perregaux Cat's Eye Tourbillon. Claret’s Marguerite watch is as romantic as they come, with two butterflies chasing one another around the daisy dial and secret love messages appearing on command. Louis Vuitton shows off its watchmaking prowess with the pretty pink Tambour Blossom Spin Time watch, which is equipped with diamond-studded cubes that tell the time by rotating and changing colour from white diamonds to black diamonds. The Upside Down Art Deco watch by Ballouard, with its modernist geometric dial set with feathers and precious stones, displays 11 numbers upside down while the number in the correct upright position indicates the hour. My prediction for the winner of the Ladies’ High-Mech category is Bulgari’s Serpenti Incantati Tourbillon Lumière watch, below. Having snaked back into the limelight this year, Bulgari’s iconic Serpenti watches have appeared in countless guises, including this absolutely stunning haute horlogerie model with a skeletonised tourbillon movement and all the sleek sensuality of the Serpenti collection. Bridging the realms of haute joaillerie and haute horlogerie with seamless style, the Serpenti’s organs are so beautifully finished and decorated that the eye is drawn to the amazing orchestration going on under the dial, dominated by the 60-second troubillon, a visual reminder of the life force animating this creation. Keeping guard of the show is Bulgari’s new articulated snake, with a diamond-studded body wrapped enticingly around the dial and crowned with a gorgeous rubellite head. For the High Jewellery watch category, the GPHG is looking for “watches demonstrating exceptional mastery of the art of jewellery and gem-setting, and also distinguished by the choice of stones”, with, naturally, no restriction whatsoever on the amount of carats. Secret watches are still very popular, allowing the wearer to hide the dial and enjoy the bracelet, as in the case of Audemars Piguet’s spiky Diamond Fury, Chanel’s Secret Watch and Graff’s adorable Princess Butterfly, which spreads its diamond-laden wings to reveal the time. 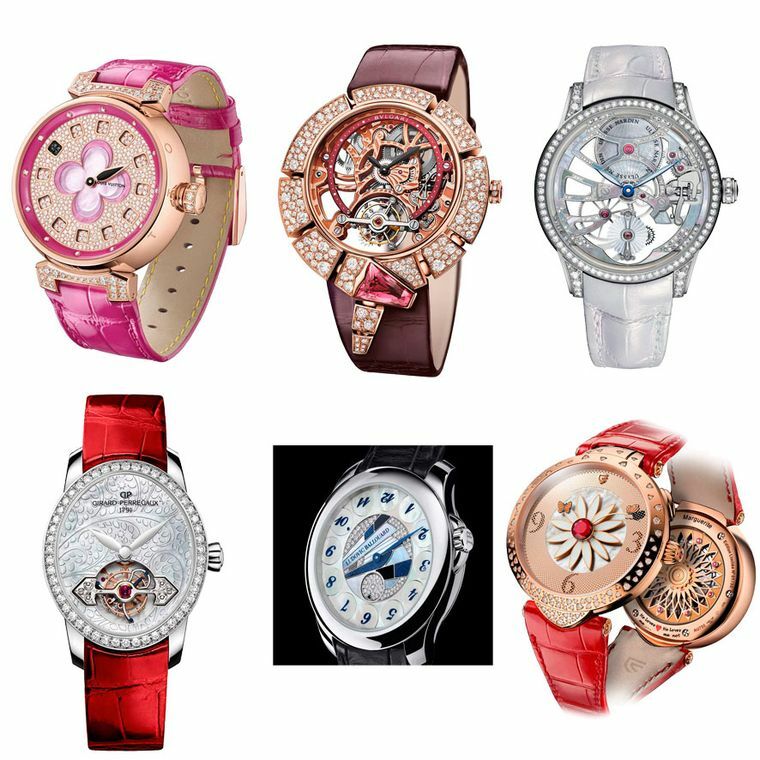 Clockwise from top left: Chopard Precious; Chanel Signature Grenat; Hublot Big Bang Impact Bang; Graff Princess Butterfly; Audemars Piguet Diamond Fury; Voutilainen Scintillante. Hublot’s Big Bang Impact Bang is dazzling and looks like somebody took a sledgehammer to a diamond mirror and shattered it into smithereens to great effect. As with everything Hublot, the wow factor is high, as is the price tag of 650,000 CHF. Voutilainen’s Scintillante watch combines a lovely palette of stones to recreate an autumnal mood, and the Precious Chopard watch dripping with sapphires and diamonds evokes the flurry of a flowery tutu. 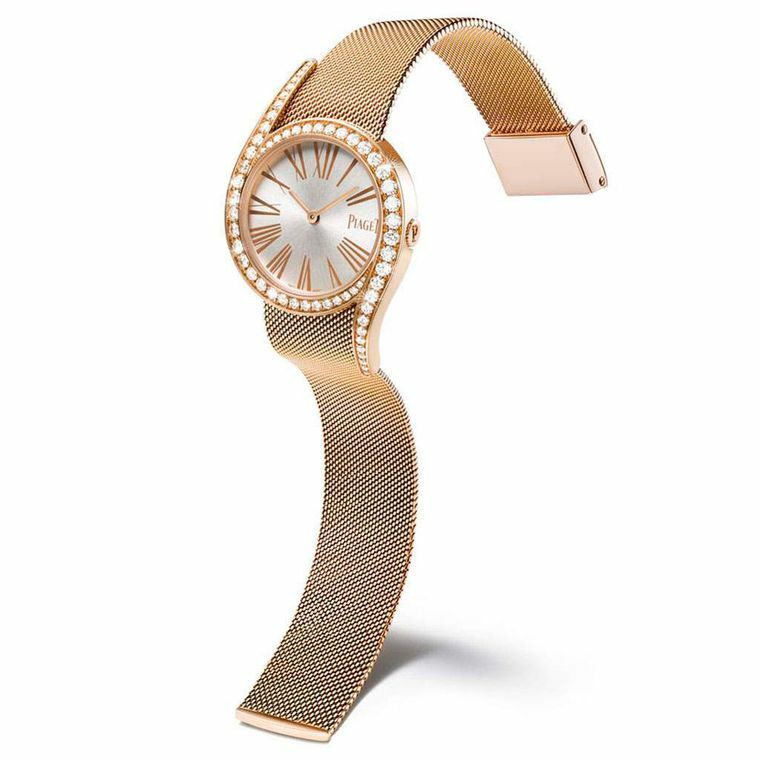 But my prediction for the winner of this category goes to Chanel’s dazzling Signature Grenat Secret Watch, below. Chanel's spectacular Signature Grenat secret watch, with sapphires, garnets and diamonds, is a one-off piece competing in the GPHG Jewellery Category (759,000 SFR). The iconic matelassé - or quilted motif - which Gabrielle Chanel took from the world of horse racing for her legendary 2.55 handbag emigrates to high jewellery, and this supple white gold cuff sits like a piece of precious embroidery on the wrist. 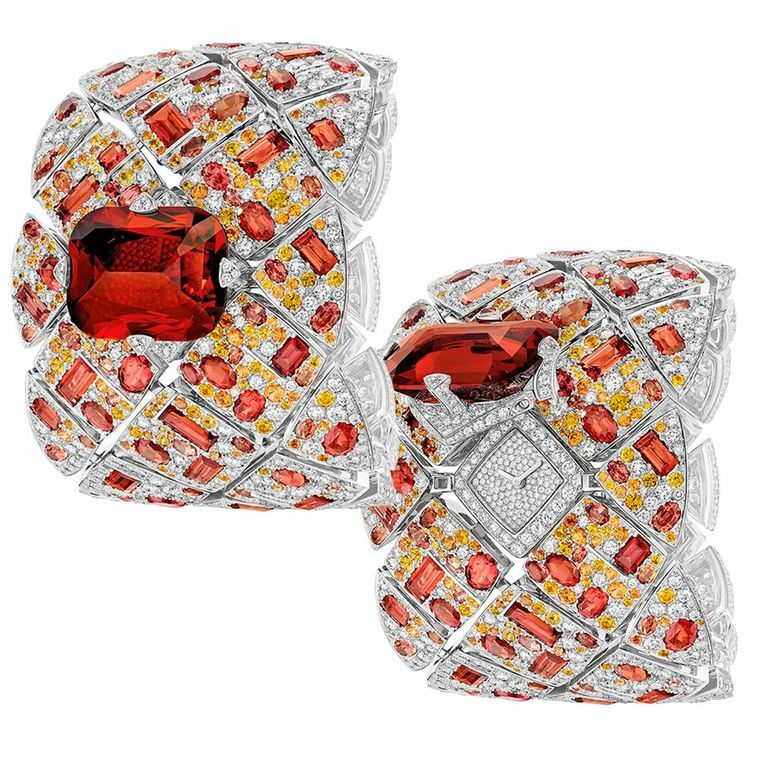 The bracelet is set with a delicious assortment of fancy-cut orange sapphires, brilliant-cut yellow sapphires, spessartite garnets and diamonds, crowned by an impressive 39.9-carat cushion-cut garnet that slides back to reveal the secret diamond watch. A one-off piece with a total weight of 78.9 carats, this also happens to be the most expensive watch in the jewellery section and will cost the lucky owner a cool 759,000 CHF. What are the GPHG awards? GPHG stands for Grand Prix d’Horologerie de Genève or Geneva Watchmaking Grand Prix and is an annual watchmaking awards event now in its 16th edition. Celebrated since 2001, the contest is often described as the Oscars of the watchmaking world and was created to “reward the most remarkable watchmaking creations in order to contribute to enhancing the worldwide reputation of the watchmaking art”. 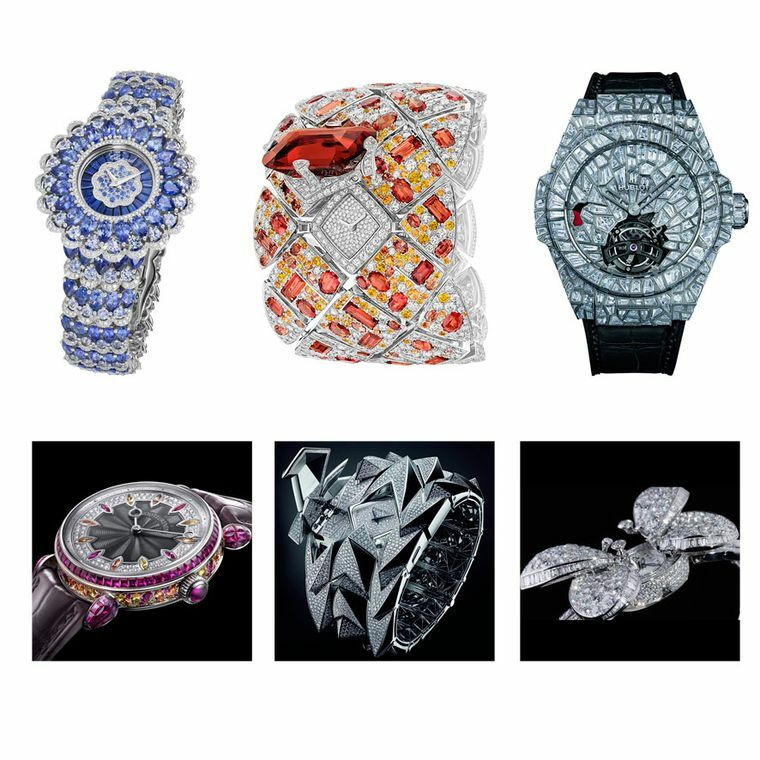 This year, 12 different categories - ranging from high jewellery to calendar watches, tourbillons to highly complicated mechanical watches - have been designated, and each category is comprised of six candidates, which are scrutinised by an independent jury of 28 watch experts. 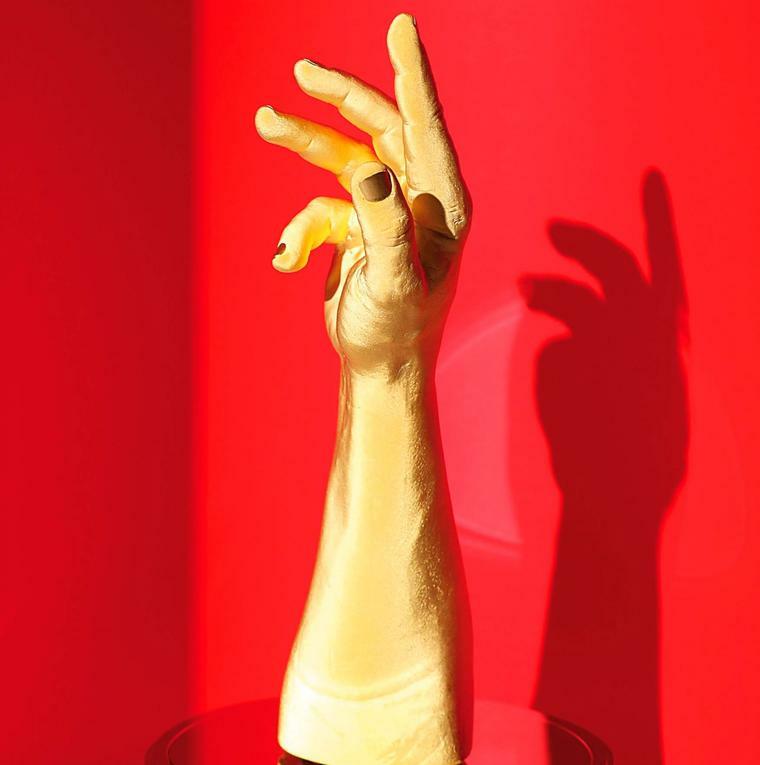 The prize-giving ceremony will be held at the Théàtre du Léman in Geneva on 10 November, during which winners of each of the 12 categories will receive a golden hand inspired by Michelangelo’s Sistine Chapel fresco, ‘The Creation of Adam’.